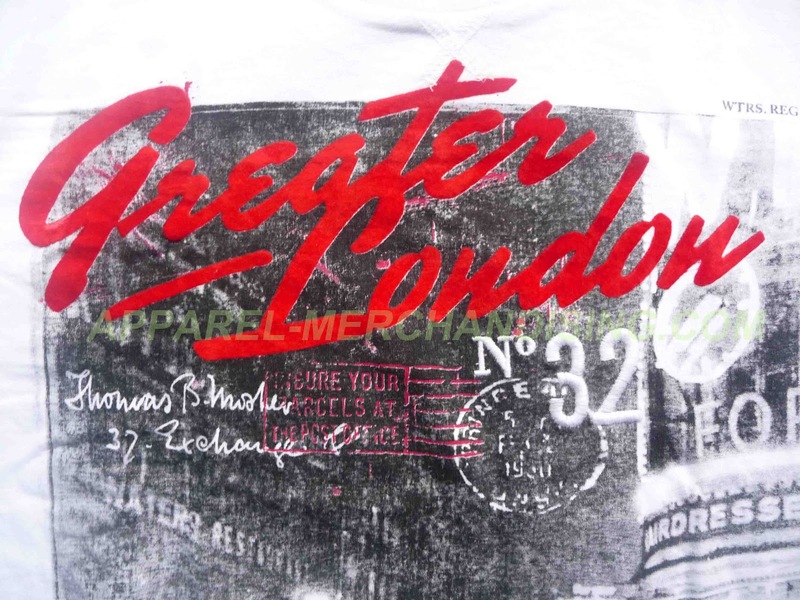 After introducing the Pigment print and Burnout print today I will introduce you with an another quality print. We already know the print is very important for this apparel sector. 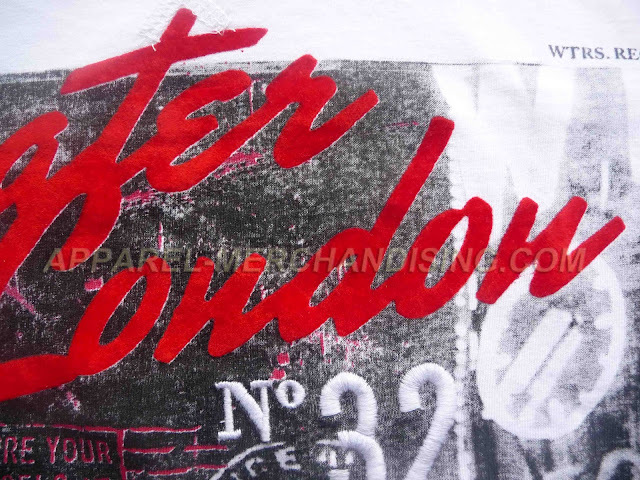 Also we are already aware that, how a prints makes the garments more attractive and saleable. 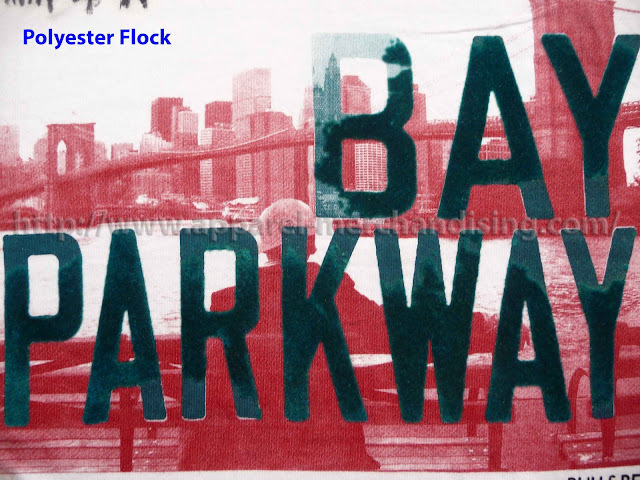 Today I will tell you about Flock print. Flock print is also a very attractive print. The looks and feeling of flock prints are very nice. 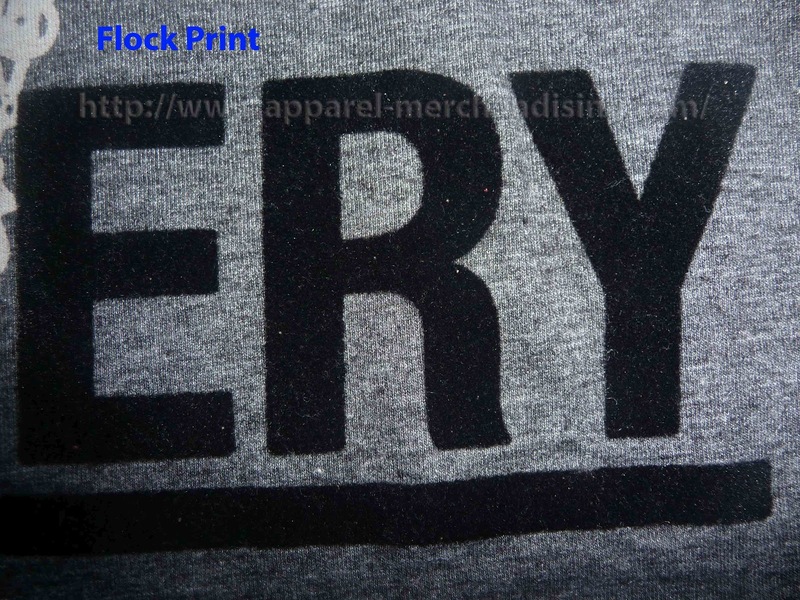 Flock prints are not same as other color/dye print. 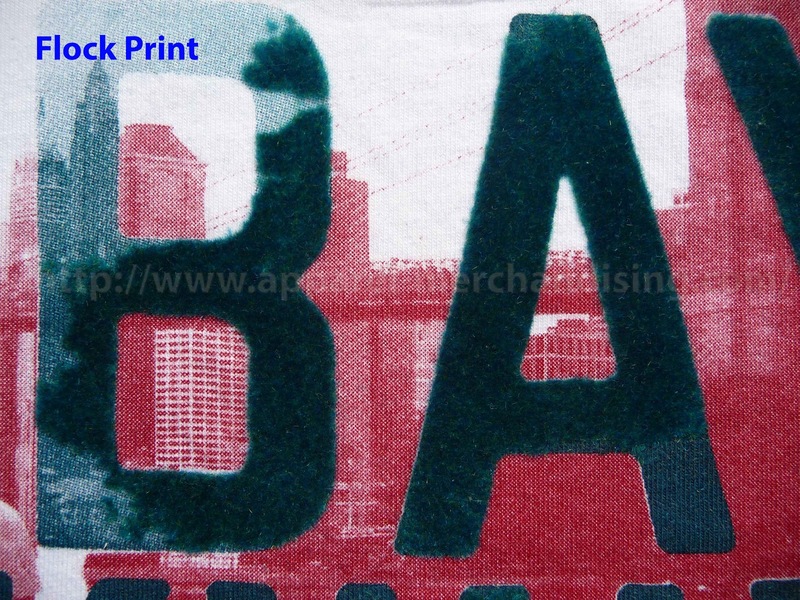 The printing technique of flock prints is totally different from as usual screen, auto machine and rotary prints. The printers didn’t use any dyes and chemical during the Flock print. They use normal printing Screen, Gum and powder of fiber. 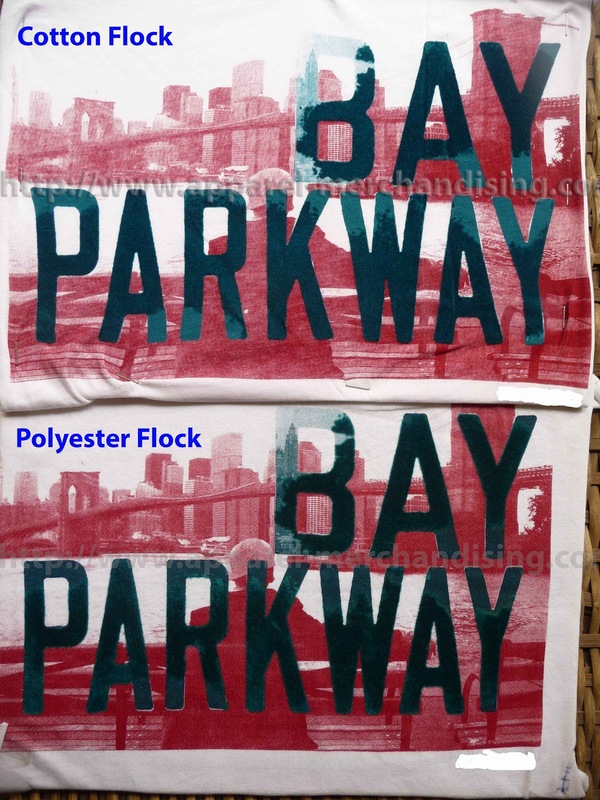 b. Polyester flock print. This polyester flock print also known as Nylon flock print. Cotton flock print is a most common type of flock prints. We know the main materials of flock print is a powder of fiber. That means the flock is a very very small part of the fiber. 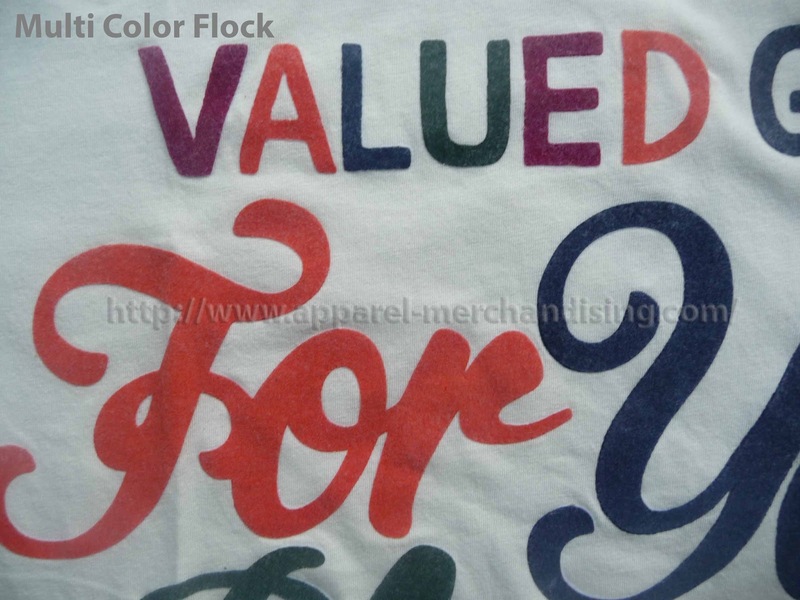 When we produced the fiber for flock print from cotton source, we called it cotton fiber. And when we use this cotton fiber for flock print we called the flock print as cotton flock. 1. It is not so harmful for human body as polyester flock. 2. The fiber didn’t stay on the fabric surface after the print. 1. This type of flock print is not glossy as polyester flock print. 2. Hand feel is not so good and soft as Polyester flock print. 3. It is not available in the market as Polyester flock. When we produce the flock powder from polyester or nylon source then we called it Polyester flock. 1. The polyester flock print is very shiny and attractive. 3. 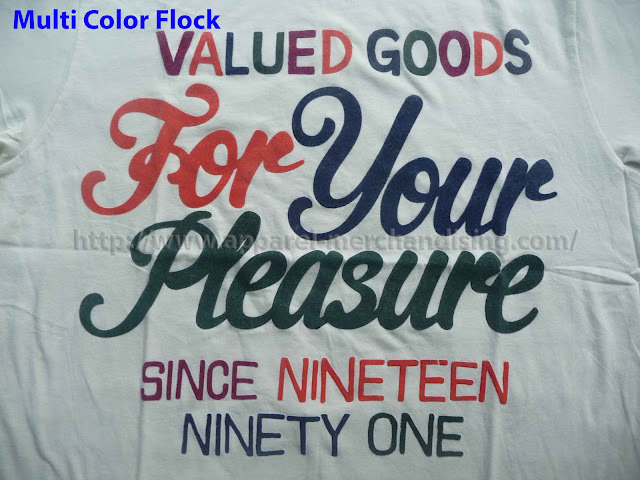 Polyester flock is very common in the market. 1. Polyester flock can be a cause of allergy in the human body. 2. Polyester flock remains on the fabric surface. It’s a common flock print. Most of the buyers asked for single color flock print. 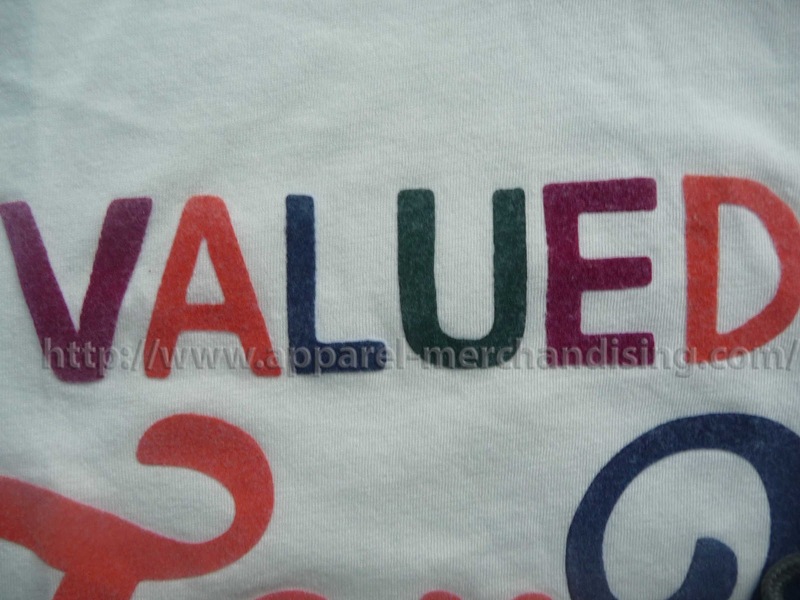 Single color flock print quality always remains very good. It’s a very difficult process. It makes the flock quality very poor. Actually a multi color flock print becomes a felt type print. Please always try to discourage the buyer for this print. It makes the hand feel of flock print very poorly. 5. An electric plate with appropriate power supply. 7. Belt curing machine or Heat presses curing machine. 1. Preparing the print screen and arrange the flock powder: After getting the artwork or design from a buyer we prepare the screen for printing. Also we collect the flock powder as per buyer color requirement. Also we have purchased the flock based on buyer quality requirement. It can be Cotton flock or Polyester flock. 2. Making the Gum: After arranging the flock powder we make or purchase the Gum. This Gum must be high quality. In previous we prepare the gum ourself with the mixer of some chemical, which was risky. Because, if you fail to prepare correct quality of Gum then the flock will be coming off. At present most of the print factory buys the Gum from chemical house. In this regards please note that, this Gum has a limited expiry period. Which is +/- 6 hrs. After preparing the Gum we can maximum use this Gum for next 6 hrs. 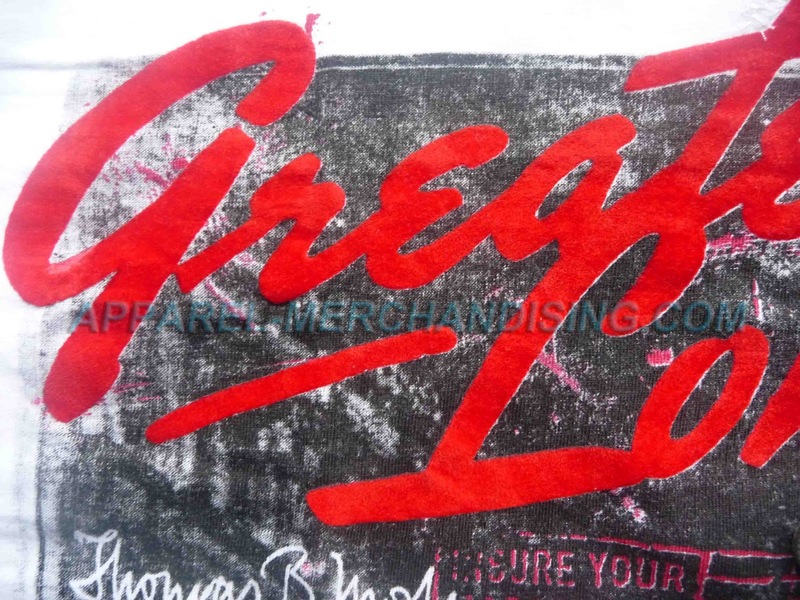 If you the printers use it after 6 hours then flock print can be washed out or come off from the fabric. 3. Lay the fabric and paste the Gum: Now we lay the fabric on the table and paste the Gum on it by using the the print screen. This time screen man paste the Gum on fabric instead of color. Gum take the place on the fabric as in design. 4. The Flock print: After pasting the Gum on fabric as per design by using the screen we put the fabric on an electric plate. Actually this technique is for polyester flock print. After putting the fabric on the plate we place the flock powder on it evenly by use of a net like tools. In this point the electric plate attracts the polyester fiber by electric power. In this process Gum attached the flock with fabric. 5. Finishing process of Flock print: After placing the flock on fabric we dry fabric. 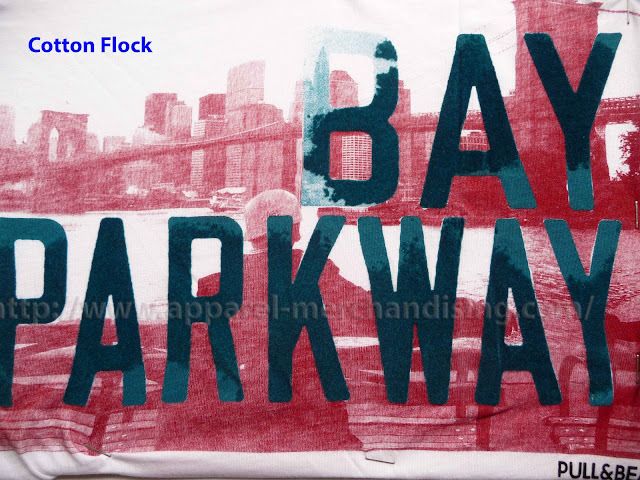 We dry the flock printed fabric by a belt curing machine at a specific temperature. 6. Then we check the quality and deliver the goods for sewing. 1. Normally the cost of Flock print is two or three times higher then rubber print. 2. For a full front single color flock print the printer will charge you $6.00/doz. Its may vary based on the size of the print. 3. We buy the flock powder from local market in kg. The normal white and black color flock powder price is $10 - $12/kg. 4. Except the white and black color flock the other colors flock powder price is little bit higher. The average price of color flock powder is $14 to $18/kg. 1. Always wash the printed sample or strike off for checking that the flock is not coming off. 2. Always avoid order with multi color flock print. 3. Use Gum tape for removing the dust from garments. 4. 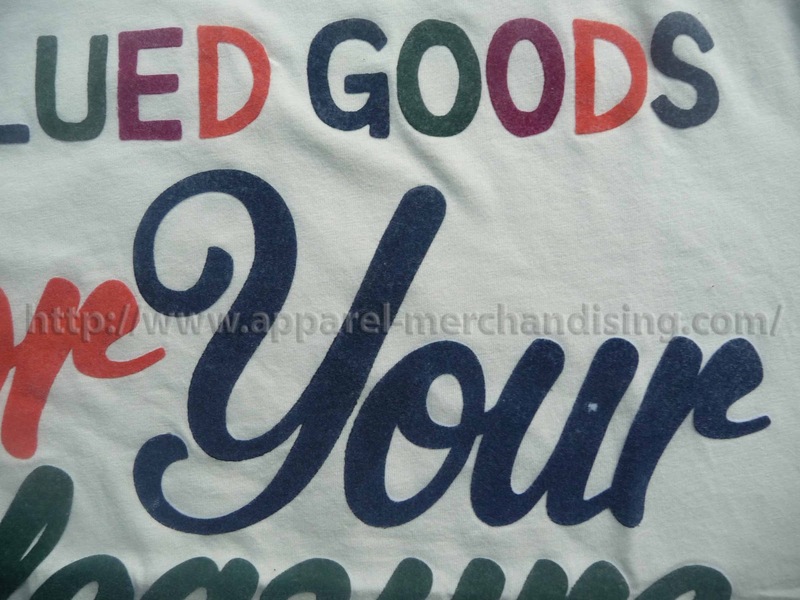 Take confirmation from your buyer that he has not problem with Polyester flock print. 5. Wear mask during put the flock powder on Fabric. 6. The production is slower than others print. So, take enough days from buyer for shipment. 7. Make the flock printing in a room like the place because flock powder can effects on the others prints. If you have any doubt regarding above flock print then please feel free to contact with me.